Sweet Floweret: Sweet Monday Giveaway- Print of Your Choice from Doodle Graphics! Sweet Monday Giveaway- Print of Your Choice from Doodle Graphics! Happy Monday! It's happy because I do a feature and giveaway from amazing Christian artists each Monday! Last week was an ABC Scripture Book from Yellow Desk Designs. The winner? Dah dah dah dah----Gina L.
Don't fret if you didn't win. There are so many more excellent artists lined up. Today, though, I'm so happy to feature Nancy from Doodle Graphics! Nancy's story in graphic design started 12 years ago. She was asked by a friend to fill a graphic design job without any experience! They showed her the ropes and the rest is well... read on! In May of this year, a friend encouraged her to use her more than decade of experience to sell some of her own designs on Etsy. "Most of my design ideas come about because either I, or someone I know, needs a gift for someone. The idea for my newest print, My Peace I Give to You, came to me just the other morning. I woke up early with a dear friend on my mind who has just been told by her doctor that she has breast cancer. She and her husband have recently returned from 8 years on the mission field. I immediately thought of the scripture where Jesus told his disciples not to fear and that he would give them his peace! I grabbed my Bible and searched. There it was - John 14:27. I thought... this is so powerful. She needs to read these words every day! A few drafts later....I had a beautiful reminder of God's promise.... to her.... printed, matted and ready to deliver. Later that morning I decided to design a series of God's promises to us and sign them ....love, Jesus. Kind of "love notes" from Jesus to us." Here's the design she made inspired by thoughts of her friend. Love it. 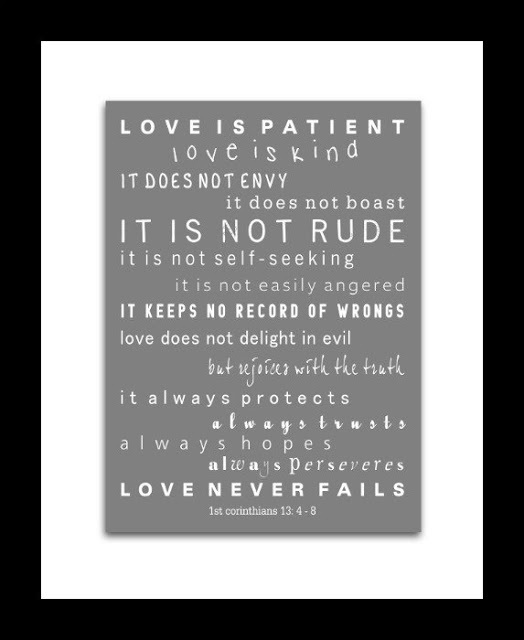 1 Corinthians 13:4-8 What a great passage to have on your wall! Don't you just love that story and how God inspires us through His Word? How Nancy was able to use her gift to bless her friend? I asked Nancy about her shop. "I love typography and I love God's word. They go hand in hand for me. So that's what you'll find a lot of in the shop right now :) Along with that there are a few coffee related prints (I live near Seattle and I LOVE coffee) and some Subway Style prints that are SO popular right now. My subway prints are all custom designs using 10 -20 of your favorite names, places, dates or words which I use to create beautiful typography unique to you!" Nancy is giving away one print of winner's choice! Here's how to enter. Super easy. :) Up to 3 ways to win. 1. Go to Nancy's shop and comment here on your favorite design. PS. All Sweet Floweret Friends are eligible to enter. Who are Sweet Floweret Friends? I'm so thankful that you came and visited today. Tomorrow I will share about all the birthday madness that took place this weekend. Highlights? Weather. Family. Friends. Smiles on kids faces. Lowlights? I feel sick as I type this from eating too much cake and other junk. I will never eat again. Never. Shoot. I'll probably be hungry in an hour. That always happens. Ok. I said I'd share tomorrow so I'll share tomorrow. Must go lay on couch. Thanks for the opportunity....my fav is the first one....my peace I give to you signed Jesus. I love them all, but I think my fave is the My Peace one...because it says, "Love, Jesus"! I love that!. I posted the giveaway on both my fb pages! And shared on twitter!! I shared the giveaway post on my personal and blog Facebook pages to pump up the exposure. I love the Scripture Art. My favorite is Jeremiah 1:5. How true it is!!! God is such an awesome God! I love the Christian scripture subway art, but lots of her stuff is great!